It’s no secret that LP started school on Wednesday. Aged four and 2 weeks, LP looked tiny in her uniform but so grown up at the same time. She was excited all morning and could not wait to put that uniform on, get to school and see her new friends and teacher. LP has made us so proud this week – seeing her carry her school bag, pick which meal she wants for lunch each morning when we get to school and then go into her classroom without so much as a backward glance. 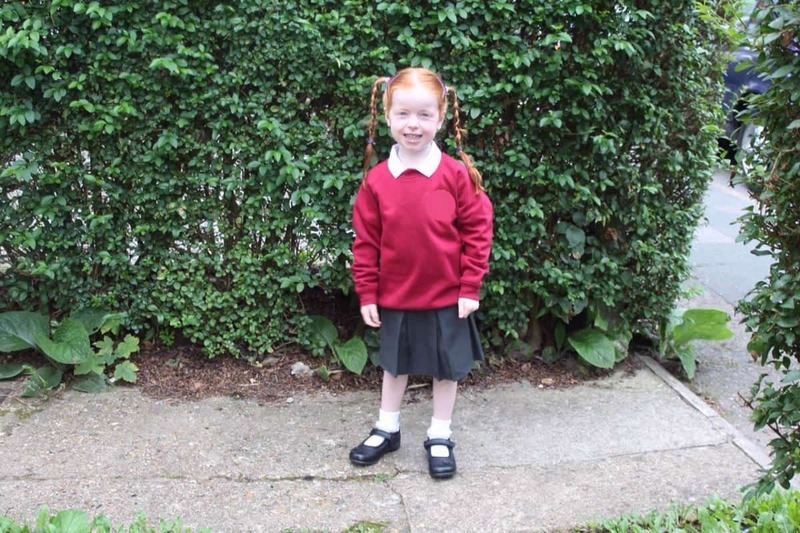 The three days she has spent at school – two half days and a full day on Friday – she has loved. She’s come out to us smiling at the end of the day and she talks non-stop about the things she’s has done, the children she has played with, lunch that she has eaten and everything else that she has done that day. LP loves school. She loves the routine and she loves waving goodbye to us and seeing us again at the end of the day. LP is already very set in her new school life and although she is still small, and young, I know that she is ready for school. These last few days have shown me how grown up LP has become, how resilient and how adaptable she is. She isn’t phased by change or trying something new. She is a credit to us and I can’t wait to see what the rest of her first term brings. LP – the school girl! Her little uniform is adorable! Glad she’s doing well. Aww, bless her sweet little face. It must be such a relief that she loves school already! Glad LP settled in well to school. She’s obviously a lot more chatty than is – he’s in week 3 (well, day 9) and so far he’s done ‘nothing’, doesn’t know, and can’t remember his buddy’s name (but can remember it’s a girl and that his friend’s buddy is called Robert). I despair of finding out anything, and it sounds like his best friend’s just the same!